Being from Central Louisiana, my friend/coworker, Angel, knows the in and outs of the area. In Baton Rouge, Craigslist.com would have been one of the best outlets to find what I was looking for, however, in Central Louisiana, that site isn’t as popular. 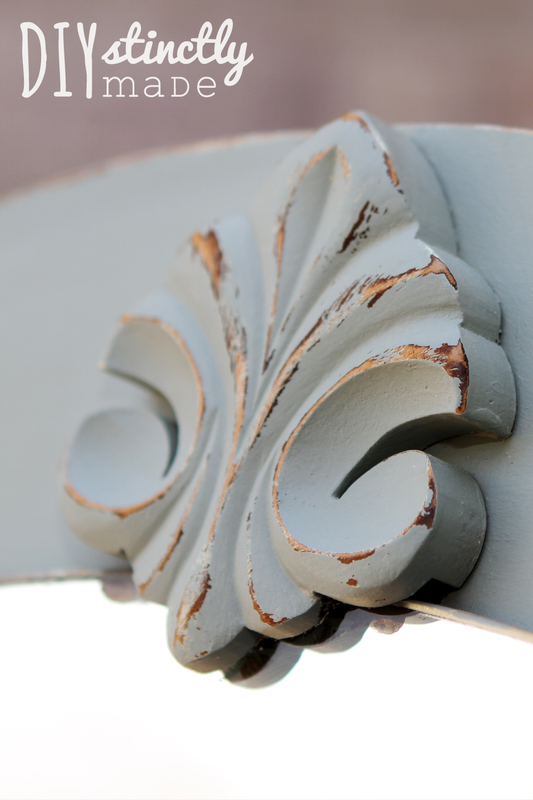 Angel had recently added me to a facebook group called “Louisiana Antiques,” and not a week after being added, a beautiful vanity in need of some TLC popped up on my newsfeed. 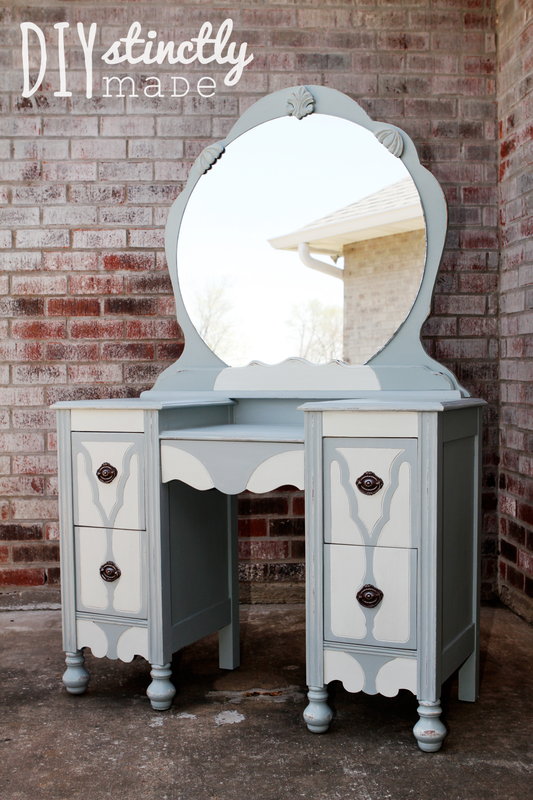 The picture was enticing (to me) but with the caption, “Antique vanity – $250,” it was out of my price range. I went on with my day but I couldn’t stop thinking about it. After a couple of days, I scheduled a time to go see it. It looked like it was in rough shape so there was a possibility I could get it for less than the asking price. I talked Kurt into coming to look at it with me, since there was no way in hell I was going alone. There are some FREAKS out there! 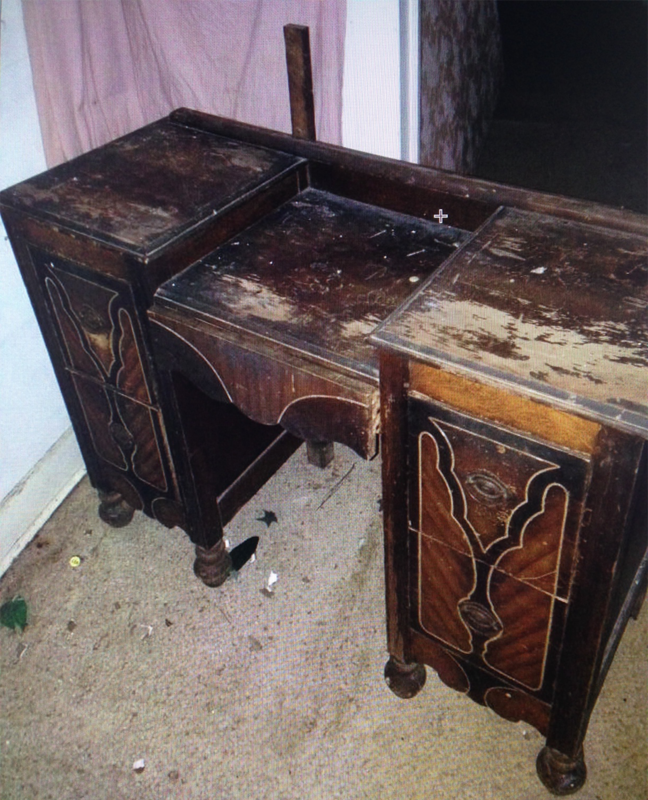 We met up and drove to the seller’s house after work one day, however, that’s not where the vanity was located. It was being housed in the abandoned house right next door. There was all sorts of goodies waiting to be sold or donated and one in particular caught my eye; a rusty milk jug. HOW COOL! When the owner said she was getting rid of everything the house, I had a for sure Napoleon Dynamite moment. 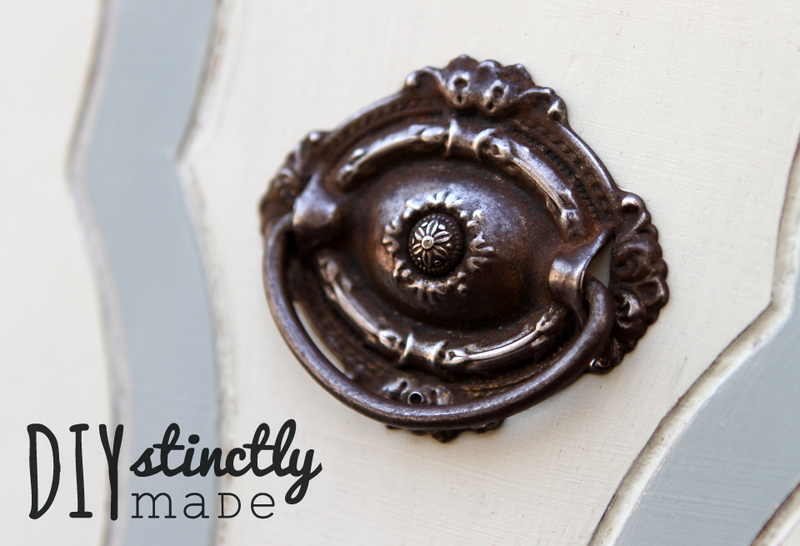 As we assessed the vanity I was having an inner battle with myself… “How much do I offer? Will they be offended if I go too low? Damnit, why am I’m so bad at this…”Then the seller said “…that’s why I’m asking $150.”$150?… But she had it listed for $250… was she mistaken? If she was, I wasn’t going to say anything. So I conjured up the courage and offered $80. HA – denied. By the look of Kurt’s face, I knew he thought that was too much. The vanity looked pretty rough, but I knew he didn’t see what I did. My offer of $100 for the vanity AND the milk jug was excepted and we started to load it in the car. 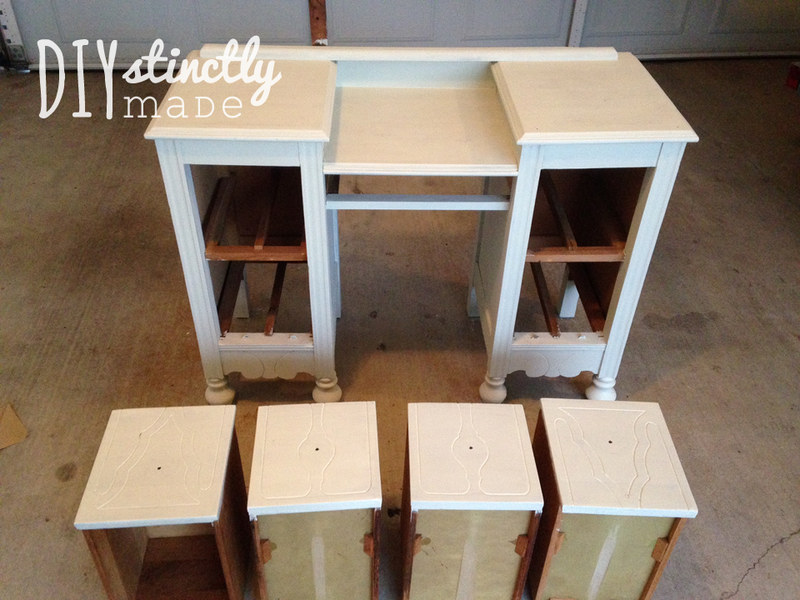 Now the inevitable question…how do I want to refinish it? I knew I wanted it to be feminine. 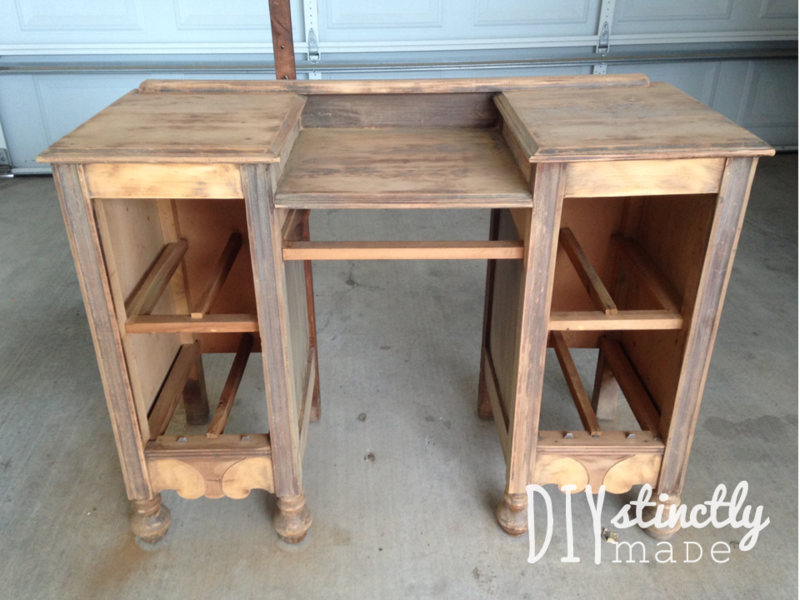 I toyed with the idea of re-staining since it is an antique – but our DIY Pottery Barn Farmhouse Bed is a dark walnut stain so I wanted this vanity to be light. I decided to go with two shades of green to accentuate the lovely details. Instead of purchasing my paint from Lowe’s, I went to Home Depot — WATCH OUT! Living on the edge here. I’m actually very glad I decided to switch it up. Unlike Lowe’s, Home Depot sells 8oz of sample paint in a flat finish. 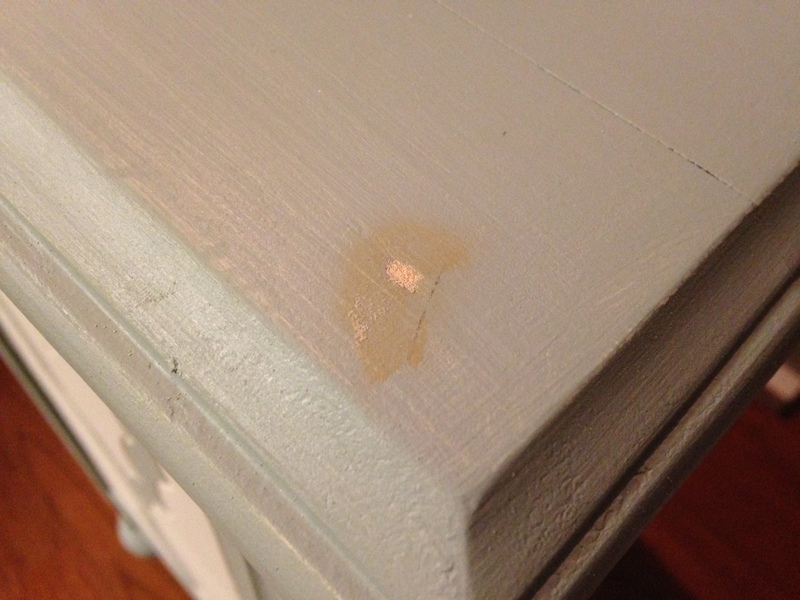 I wanted to try a wax top coat rather than a satin polyurethane and for this, flat paint is key. 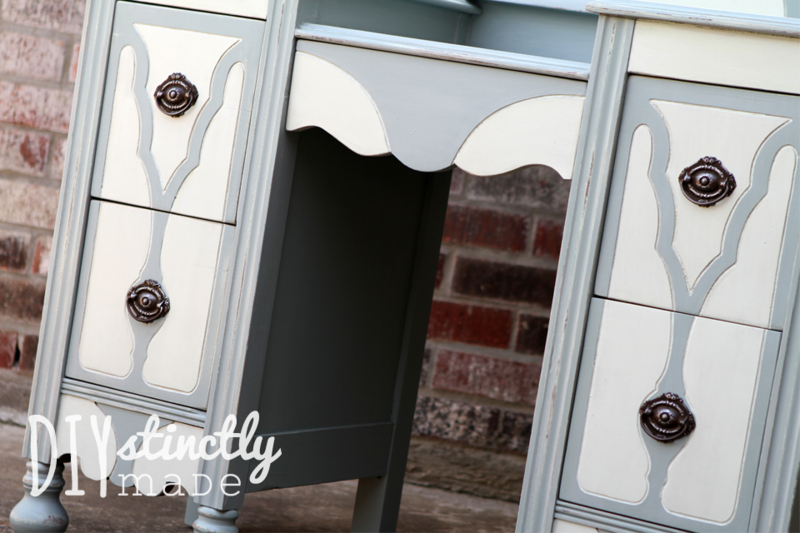 Alot of people think you have to use a wax with chalk paint, but that’s not the case. It works great with flat paint, too. And guess what? An 8oz sample of paint is less than $3. I sat in the paint section for a good 45 minutes debating which colors to go with. I ended up choosing a very light green, Mountain Haze and a darker green, Pinedale Shores. 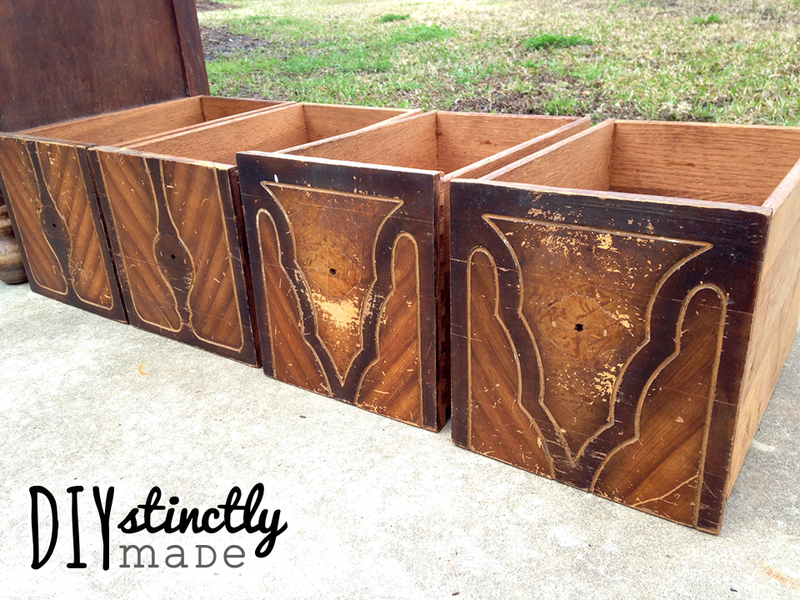 I started off by removing all the hardware from the drawers and the drawers from the vanity. Next I whipped out my handy dandy random orbit sander, slapped on a sheet of 150 grit sand paper, and got to work. There were some pretty intense markings on the surface that needed to be smoothed out and the orbit sander did the trick. Once everything was sanded smooth I began painting my base color, Mountain Haze. I used my good brush to apply it being sure to make it a thin even coat. When painting furniture you want to paint thin coats so you don’t lose any detail under thick paint. The Behr Ultra flat paint covered very well – the second image below is after 1 coat. After my base coat was dry, I lightly sanded with 220 grit sand paper. Next I painted 1 coat of my darker color. I used the pictures I took to reference which pieces of the detailing were originally darker. 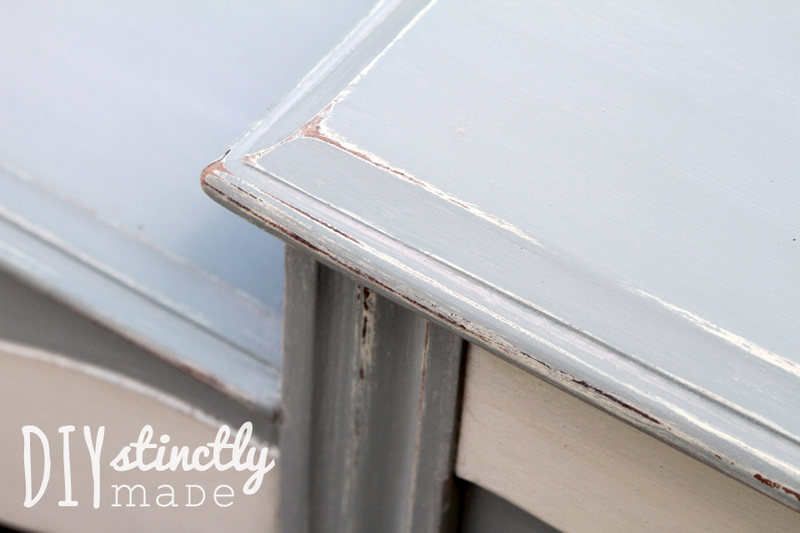 After my first coat of Pinedale Shores was dry, I lightly sanded with 220 grit sand paper. 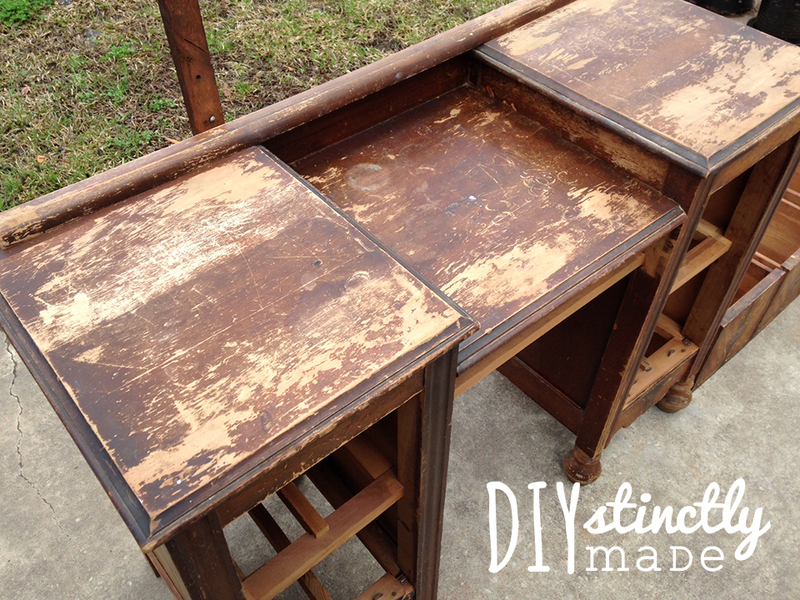 There were a few parts of the desk that had unsightly gaps where the wood had shrunken through the years so I filled those with wood filler and sanded when dry. I repeated the previous steps by painting the second coat and lightly sanding with 220 grit sand paper. 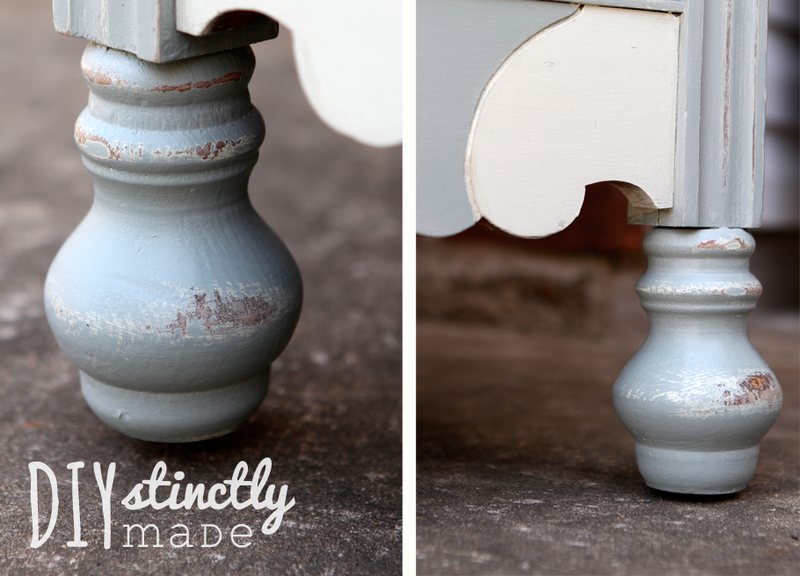 Sanding inbetween each coat will ensure you have a smooth finish. The picture above was taken before sanding so you can see some of the brush strokes. 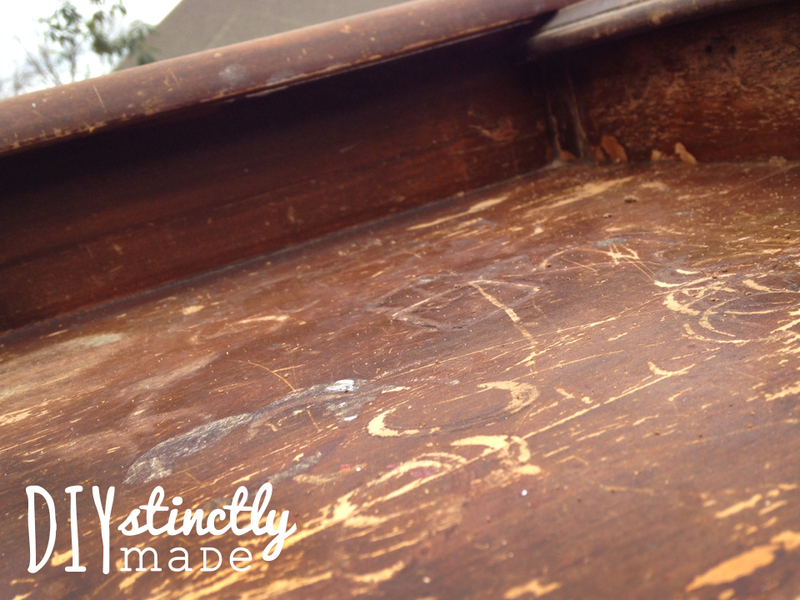 These brush strokes are still there but they aren’t as visible after sanding. Having a little texture was good for my next step, fauxing. I bought a small can of Sun Bleached Varathane Wood Stain. I thought the light tan/gray stain would give a nice depth to the texture of the vanity. I applied the stain with an old t-shirt and wiped off with a clean part of the rag after a few seconds. 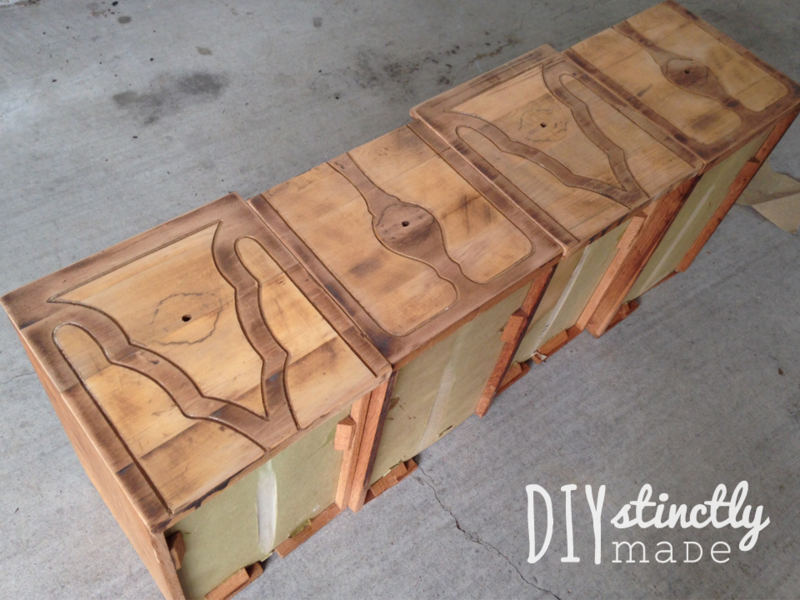 After the entire piece was fauxed, I sealed the entire piece using Minwax Paste Finishing Wax. 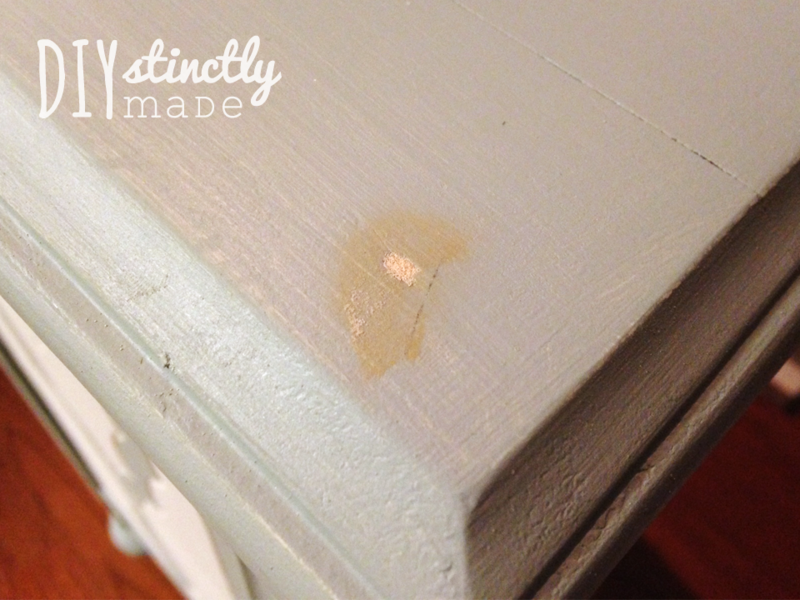 This was the first time I have used wax to seal a piece of furniture and I have to say I love it. I applied the paste wax with an old rag in the same direction of the grain. After letting it harden for 15 minutes, I buffed with an old t-shirt. You’ll know when it’s buffed, because your rag will glide much easier on the surface. You’ll also see a slight sheen. I love the way the finish looks, I will definitely be using this technique in the future. 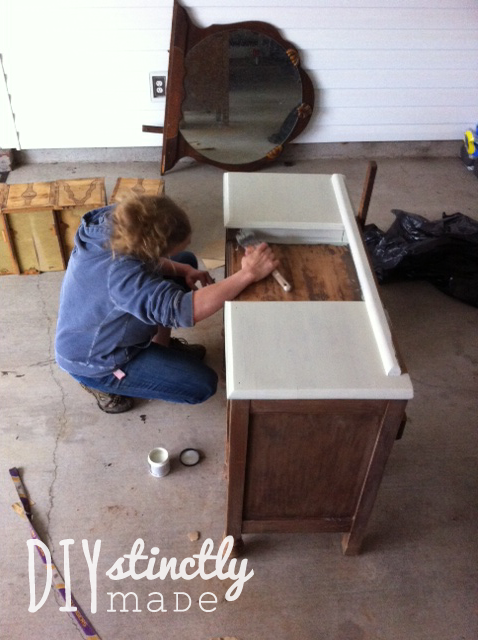 After the vanity was finished, I shifted my efforts towards the hardware. I used a SOS steel wool pad and scrubbed the metal cabinet pulls. I love the way they turned out. A little shine through the rust is a perfect finish to me. Kurt helped me complete this project by constructing a new middle drawer using pallet wood leftover from our DIY Vegetable Garden project. If you look at the original project, you’ll see it was broken. Here’s the finished product! 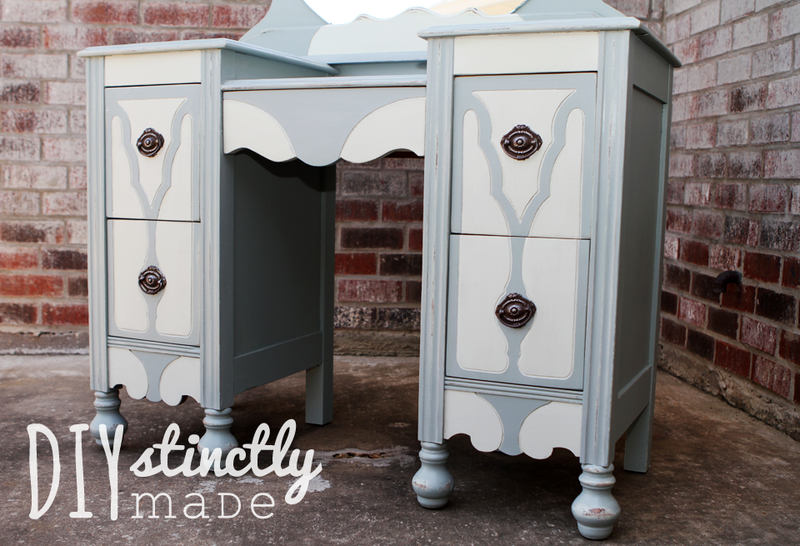 I love the way our DIYstinctlyMade vanity turned out! It fits our bedroom perfectly and lightens us the space. 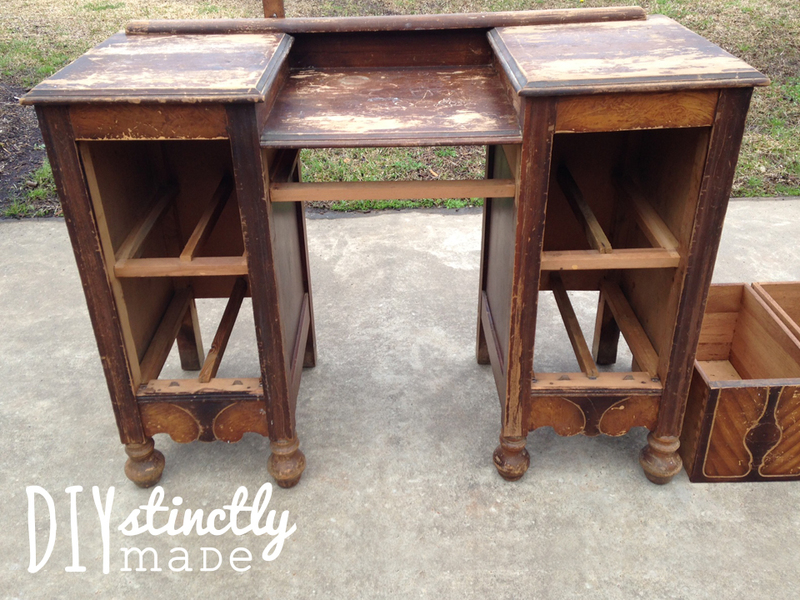 Interesting vanity, it’s true older furniture are built to last. That looks so great! I love the hardware.